Election Poster Busting: Communicative Traces of the Appropriation of Election Posters in Public Space. Case Analyses – Research Questions – Perspectives. A Workshop Report. This workshop report examines the phenomenon of election poster busting from a media-linguistic perspective. We pursue the hypothesis that multimodal transformations of election posters leave traces of the appropriation of political communication, most of which can be understood as subversive attempts at criticism of the political system and political elites. 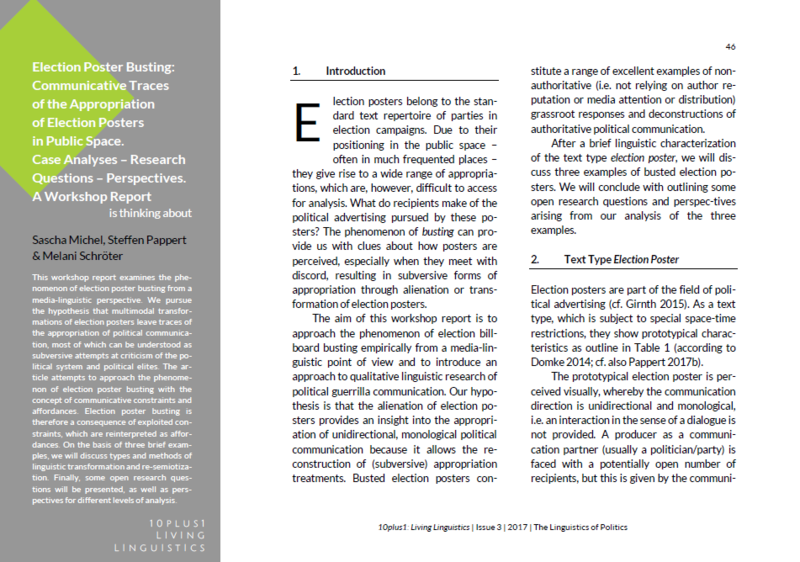 The article attempts to approach the phenomenon of election poster busting with the concept of communicative constraints and affordances. Election poster busting is therefore a consequence of exploited constraints, which are reinterpreted as affordances. On the basis of three brief examples, we will discuss types and methods of linguistic transformation and resemiotization. Finally, some open research questions will be presented, as well as perspectives for different levels of analysis. Steffen Pappert, is researcher at the German Department of Duisburg-Essen University. His research interests include: political communication, media communication, multimodality. Recent publications: Pappert, St. (2011). Politische Sprache und Kommunikation im Wahlkampf. Mitteilungen des deutschen Germanistenverbandes, 58.3, pp. 258-268. || Pappert, St. (2016). Offline-Wahlkampf: Wahlplakate. Aptum 3.2016, pp. 236-253. || Pappert, St. (2017a). Plakatbusting: Zur Umwandlung von Wahlplakaten in transgressive Sehflächen. In: H. Kämper & M. Wengeler (Eds. ), Protest – Parteienschelte – Politikverdrossenheit: Politikkritik in der Demokratie (pp. 55-75). Bremen: Hempen. || Pappert, Steffen (2017b). Zu kommunikativen Funktionen von Emojis in der WhatsApp-Kommunikation. M. Beißwenger (Ed. ), Empirische Erforschung internetbasierter Kommunikation (pp. 175-211). Berlin & New York: de Gruyter. Melani Schroeter is Associate Professor in German Linguistics at the University of Reading. Her research interests focus on political discourse analysis as well as silence and absence in public/political discourse; subcultural discourse as well as discursive defiance; comparative analyses of keywords in public discourse. More recent key publications include: Silence and Concealment in Political Discourse (monograph, John Benjamins, 2013); Exploring Silence and Absence in Discourse (Palgrave Macmillan, edited volume, forthcoming 2017).